Check out these expert tips for building a beautiful form and sending it to anyone, fast. You need an online form, fast. Whether you’re taking online orders and payments, collecting RSVPs, or using lead gen forms on your website, here’s how easy it is to get your form up and running in minutes with Wufoo. To create a brand-new form, click the Forms tab and then click New Form. If you’d rather draw from a bit of inspiration, visit Wufoo’s Form Template Gallery, which is jam packed full of beautiful, pre-made forms that you can completely customize. Once you’ve created a new form, “Untitled Form” probably isn’t the most engaging form title. So click the title, which will take you to Form Settings. There, you can change your title to whatever your heart desires. While you’re in Form Settings, you can edit all sorts of form preferences, such as adding confirmation text or redirect when your form is submitted. Add Google Analytics tracking to measure form behavior and performance--and set up a customizable confirmation email to send after someone submits your form. Now it’s time to add some fields. Click on a field to add it to your form or drag it in and place it anywhere you’d like. Once you have the fields you need, click on the field to customize it. Each field has different options to play with, but you can always change the field label, make it required, add instructions, and use CSS keywords to place your fields next to each other in the live form. Use Branching and Logic to show and hide fields, making sure users see questions that are relevant to them--saving them time. This helps you send users to different pages, or send different confirmation texts and emails depending on how the user fills out the form. Important! Always remember to save regularly, which will bring up a menu with lots of choices. From here, you can choose to share your form. Our Share Page gives you lots of ways to send your form. You can get a permanent link to your form or a title link that uses the name of your form. If you want to start sharing even faster, click to share your form on Facebook, Twitter, LinkedIn, Google Plus, or email. 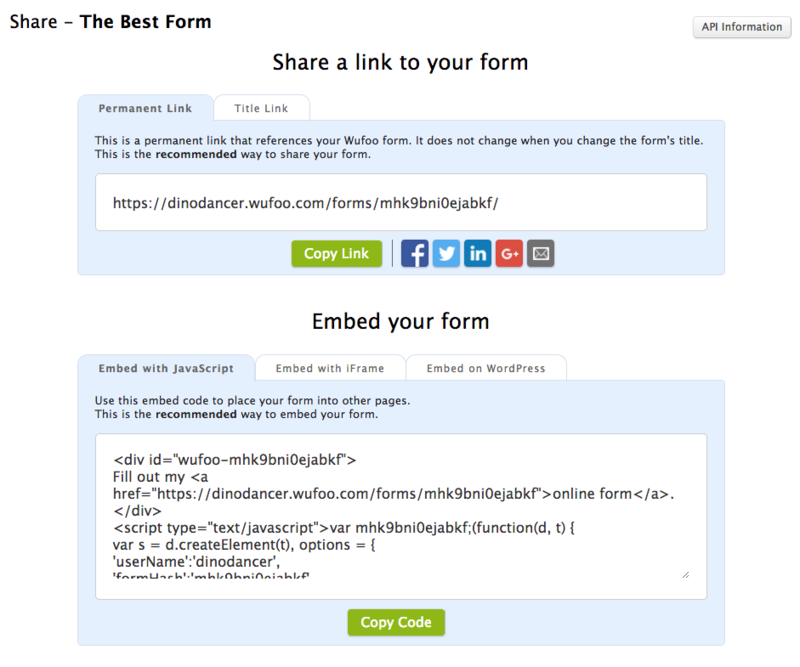 Or embed your form directly into your website by grabbing an embed code. Once people fill out your form, visit Entries in the Form Manager. Here, you can view and interact with each entry individually. Or, get sophisticated by creating a report to analyze your data using custom graphs and charts. See? Creating a great form is mega simple. Give it a try, and happy form building!